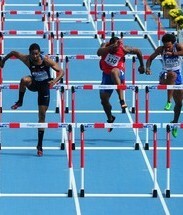 (CNS): Local hurdler Ronald Forbes made history today when he became the first Caymanian to compete in a 100m hurdle semi-final at the sport during the World Athletics Championships. The North Side native finished 3rd in his opening round heat on Saturday, with a time of 13.54 seconds, enough to secure him a place in the line-up for Monday’s semi-finals in Korea. However, dreams of making the final were dashed when Forbes came in sixth in a time of 13.67 seconds. The final itself was marked with controversy when Olympic champion and world record holder, Dayron Robles was disqualified after coming in first. According to the IAAF website a protest by China on behalf of Liu Xiang, who appeared to be impeded when Robles strayed to the edge of his lane, was upheld. Robles who was first across the line in 13.14, was disqualified, handing victory to Jason Richardson, who followed in 13.16. Liu, who came in 3rd with a time of 13.27 was moved into the silver medal spot and Andrew Turner of Britain took the bronze in 13.44. Congratulations to you Ronald. We love you and looking forward to 2012. We will all be there cheering you on God willing. Well Done . It is high time we as a people recognize that our capabilites are bigger than us and continue to support our fellow Caymanians in all areas of sports throughout these Islands. For too long talent as shown by Mr. Forbes has gone to unnoticed. Congratulations to you Ronnie keep up the good work you will continue to succeed. CNS: You must log in if you are using your real name. Well done young man. Keep up the good work and who knows, you may be the Caymanian Olympic gold medal holder or world champion. I really hope the government is sponsoring this young man. CONGRATULATIONS from you know who in the Brac. You have again done us proud. Congratulations Ronald!!! Cayman Islands is proud of your accomplishment – keep it up – lookingto 2012!!!! We're all proud of you young man. Keep up the good works! Veryy proud of you, Ronald!! Congrats!! You are an inspiration! You did the country proud, Ronald. Keep it up!